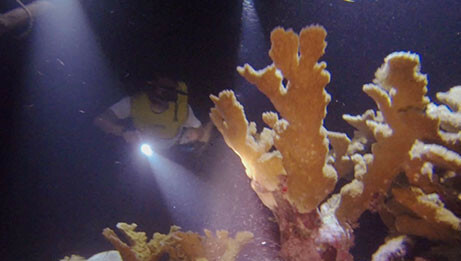 The reef is only 5 minutes offshore, forget about dizziness! 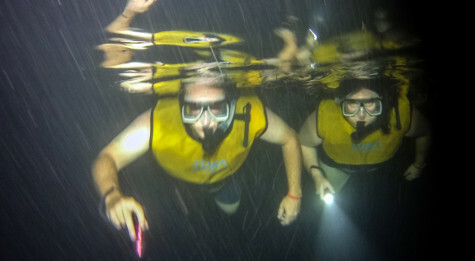 Full snorkeling gear including submergible lamp per person. 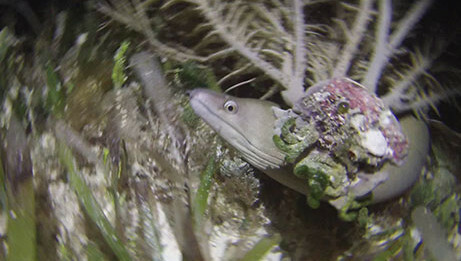 Exclusive Total Snorkel Tour- We’re the only ones offering this tour! 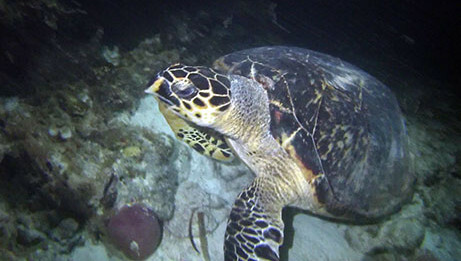 Swim with turtles, fish and lot of sealife! Bioluminiscence is something you have to enjoy at least 1 time in your life! Bookings only before 10am for the selected date. Subject to availability. 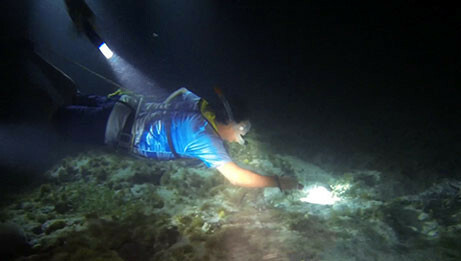 Enjoy bioluminescence on this premium night snorkeling tour in Cancun. 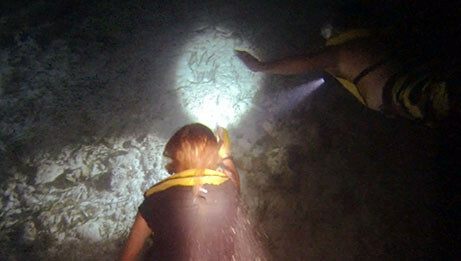 Enjoy the finest Cancun snorkeling tour. 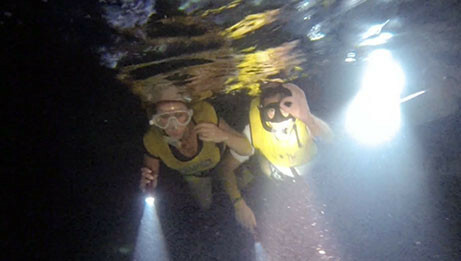 Live snorkeling on a magic and exotic way, at night! Let the moon illuminate your path as you snorkel along the warm and shallow waters of the Great Mayan Reef, covering a route of 1,000 mts (3,000 ft) swiming along living coral reef, curious and playful turtles (we find 1-5 turtles on the 95-98% of the times) and colorful fishes. Escape with us to the most otherworldly experience that Cancun has to offer. 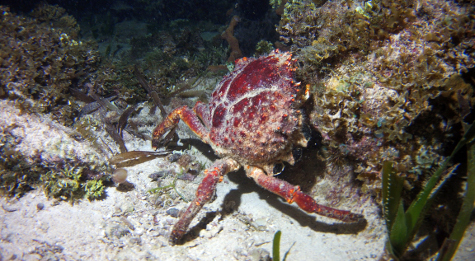 Our first stop is in very well conserved coral reef, where we'll admire different coral formations and sea life that can only be found at night such as octopus,moray eels, squid, lobsters, crabs. We'll swim helped by the current to our 2nd area, where we'll find turtles and rays. For some of our customers they consider this the best part of our tour, since swimming with turtles is such an unusual experience! Yes, really! It sounds crazy and scary at first glance, but we assure you’ll become one with nature after 5 minutes in the water. Far from being an extreme experience, is kind of a purifying one. It’s the perfect chance to get out of our daily comfort zone, and remember how little we are on this huge universe. Many guests compare the experience to Pandora of “Avatar.” Some even recall the bioluminescence scene in “Life of Pi”. Our work starts way before you arrive. Our crew marks the zone that we’ll explore with light buoys while there’s still sunlight. This is used as reference to our guides when there’s no light but the moon’s one. In addition, you’ll be provided with a submergible lamp, that will allow you to watch the coral reef and sea life to detail, it seems the colors are magnified, you’ll be speachless! The best always comes last! Imagine yourself in the sea, with nothing around you but water, in total darkness. Everything is calm and silent. Surprisingly you’re fearless, in total peace, you’ve realized you’re part of a big whole thing called Earth. The swirling of your hand, every kick, sparkle throughout the darkness. Shake your hands, move your feet, millions of lights shining around you! This is better known as bioluminiscence. It is actually the biological response of microscopic algae called a dinoflagellate, the perfectly natural and harmless concentration of organisms produces light before your very eyes, often existing in millions per liter of water. Didn’t you know we had this in Cancun? Don’t worry, 98% of the people doesn’t know either. 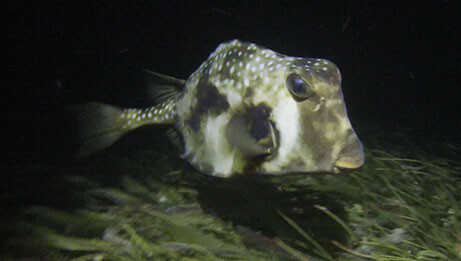 Book your night snorkeling tour now, you won't find it anywhere else, we're the only ones offering this unique tour! Small groups of maximum 10 people (in case you’re a larger group we can manage it as a special request). Our marina is less than a mile away from the reef, we get there in a short 5 minutes boat trip.You’ll be snorkeling before you know it. Masks with prescription (if needed) and the brand-new easybreath snorkeling masks (ideal for kids and non-swimmers). Snorkeling life vest, mask, snorkel, and fins always in perfect conditions. Bottled water, towels and lockers are included in your tour. Dock fee and reef conservation tax (total $10.00 USD per person). Payable at check-in. Photo and video service are optional and has extra cost. Bring some extra money, we’re sure you will want some of them. 2 hours in the water! Consider extra 1.5 hours for transportation and briefing. Available daily at 19:30 hrs. The pick up time is set according to the distance to your hotel. The exact time is sent to you on the booking confirmation. 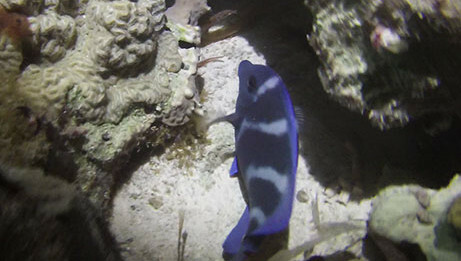 Our paparazzi will be following you during the whole snorkeling tour and will take awesome underwater photos and video, which you will be able to see before going back to your hotel. SD Card with +30 pictures and 5- 10 videos (Full HD) of you and your companion. Get it for only $45 usd (price per family of up to 4 people, not per person). Completely secure and reliable online shopping so you can enjoy your vacation in Cancun. We use a 2048-bit SSL encrypted payment. If there’s seaport closure (bad weather), enjoy your tour snorkel activity another day or if you prefer your money back. Plans have changed? Don’t worry, easy changes in day and time of activity.